The time came to take up the ulluco grown for seed tubers and this is the result. That biggest tuber is the size of a man's forefinger and represents the sort of size of vegetable that I'd find useful in the kitchen. The crop is also relatively unblemished and has cleaned up easily. I'm pleased and the first reactions from other root crop enthusiasts are mostly impressed. So how did this success come about? It's a lucky conclusion to a series of near misses and disasters over the last few years combined with the sort of nannying that I wouldn't generally find acceptable for subsistence gardening. 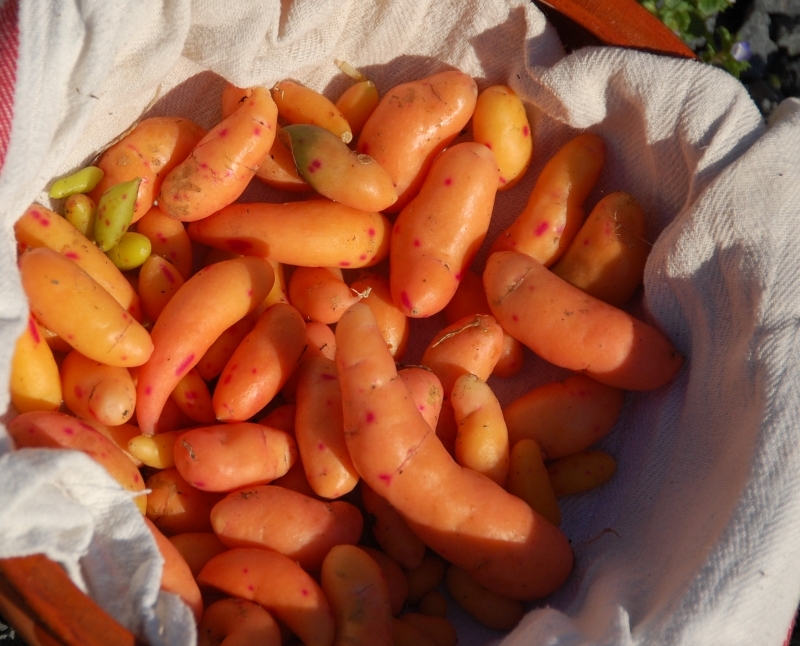 Half a dozen bean sized tubers were started in early spring in good quality purchased compost, and then grown on as a clump in a 40cm pot, initially in a greenhouse and then when the weather improved outside. They were earthed up a couple of times during the year with that same good compost which kept the plants fed. We had an excellent summer and because I water pots but not the vegetable plot unless I must these babies never dried out. Finally, in mid October they were taken into a darkened room and allowed to complete their growth cycle in artificially short day lengths. The harvest was lifted a few days ago when the foliage had died down completely and was barely even there any more. In the garden though, things aren't nearly so rosy. I planted out eighteen small pots of started tubers after the frosts had finished into well cleared ground with a handful of general purpose fertilizer to give them a boost. The plants grew well and managed to keep going even though the temperatures went into the high 20Cs over several weeks. It seems deer don't like ulluco (yet) and they were ignored while Bambi and his mates destroyed most of the oca in the bed next to them. In October I fleeced the plants for cold and deer protection although as it happens a very mild autumn has produced few frosts. Looking at these plants for tubers at the same time as taking the potted plants revealed almost nothing below ground and only teeny tiny tubers just starting on the leafy stalks above ground. Clearly the field management needs a new strategy. On the Radix Root Crops facebook group I've seen others with better results this year and I'll try their plan next time, not just fleecing but covering with a mulch of straw in October. For this year, I've earthed up over the stems and baby tubers and put the fleece back on. Perhaps in a month it will be worth another look. I do wonder if being a touch further south in Normandy is a disadvantage even with the warmer climate because the change in day length with the seasons is just a little bit less pronounced and the rate of change less dramatic as a result. Further north the nights are longer sooner which would help advance cropping considerably. Early starting might be another approach. On the small potted plants that I start in January there are often signs of tiny tubers forming. I don't know what happens to these as the days lengthen. Do they stop growing or having started could they be persuaded to keep going with careful management? And is this sort of obsessive attention really worth it for vegetables that are mainly interesting for their novelty but aren't particularly more delicious than other easier European adapted roots. Whatever, it's inspired me enough for now that I'll give it a go again and even see if I can search out some different varieties to start a breeding line - not that I have a clue about the pollination requirements. If I have to import a particular Peruvian slug as a vector I might yet give it a miss. I'm putting some of these on the swap page but I've already got a list of takers as long as my arm so if you're interested please speak up quickly. I can't guarantee you'll be lucky. Beautiful. That is a really nice looking variety - I'm not sure we have that one on this side of the Atlantic. I did a little experiment this year that might benefit you. When I was done harvesting, I stuffed the whole plants back in the holes and buried them completely. I just dug one up after two weeks, during which the ground froze several times, and found that the plant made more tubers. So, one could potentially just bury the entire plant as frost approaches and dig it up weeks later for a larger harvest. Hi - really interested in your ulloko crop. I'm in Edinburgh, Scotland - can you advise on where I could get hold of seed or tubers to grow, please? Can you email me your reply please to p.upton@rbge.ac.uk?